In 5 weeks you will learn essential techniques of bellydance that will all come together in a gorgeous choreography. Experience the joy of moving feminine, sensual and powerful. I have long working days at the office, I hardly have any time to have hobbies in my life. After a day of work my body feels cramped, my shoulders hurt and my hands are stiff. I work in an environment with mainly men and I find it hard to be very feminine around them. I wish to be in touch with my feminity more and to express my softer and sensual side. Sometimes my days at the office seem so grey, I miss colors and sparkles in my life! I have such a busy life, I hardly have time to do sports or dance classes. I am happy when I get home, but I miss moving my body. I miss the interaction with other women in my life, I would love to be part of an international community. I wish to learn more about other cultures, their way of expressing themselves and their music. I recognize that feeling very well. You probably would not expect that from me as a dancer, but in my business I have to work with the computer to make my websites and to edit my videos for example. That makes me feel just like you: cramped, stiff and isolated. Many of my students also have intensive jobs. They are very good at what they do and feel passionate about it, but they make a lot of long hours at the office. They experience so much joy and really feel so many physical and emotional advantages by having bellydance in their busy lives. I believe that I can help you bring that spark into your life by teaching you the art of Bellydance. It will help you feel more feminine, sensuous and energetic, more delightful, flexible and healthier. In 5 weeks you will learn essential techniques of bellydance which will all come together in a gorgeous choreography. Avoid travelling hours after work because now you can learn to bellydance from the comfort of your own living room. Feel connected to your womanly energy and move gracefully. Learn a whole new range of movements from wavy, to juicy to strong staccato and trembling movements. Discover muscle groups that you did not know before and learn how to use them. After 5 weeks you can dance a captivating and gorgeous choreography. Connect to the music and get inspired to express the music through your body. Connect with me and with the international community of women that are doing the course as well. Ask your questions, share your experiences and your AHA’s with them. Hello BeYOUtiful! My name is Aisa Lafour and I am a passionate and dedicated Bellydance teacher. Winner of the Bellydancer of The World contest in 2008. Owner of the Heartbeat of Bellydance School in Amsterdam and online. Since 2003, I taught thousands of women around the world how to bellydance. I love to help women love themselves more, become more feminine, graceful, sensuous and more confident. Make them experience the power of the community of like minded women, through the fascinating art of Bellydance. Meet the camera woman: Janou from Hertz Media, who was my babysitter and art teacher when I was a child. Nowadays she films and edits my online courses. It’s a very pleasant and professional cooporation. Every week you will receive an email with a link to access the class in the Bellydance academy website. Each class has different bellydance techniques, drills and a combination of the choreography. Connection, help and support in the Facebook community. Livelong access to the classes. You can repeat it as often as you you like, livelong, as long as the program runs . In the first class you will learn about a correct posture and you immediately learn how to strongly move your hips up and down while making a hip slide, we call this hip hits with slide. You will also learn how to tremble your hips in a hip shimmy and learn a beautiful elegant movement of your arms: the snake arms. All those moves come together in the first combination of the Choreography to Nibtedi Mnin al Hikaya. In the second class you will learn one of bellydance's signature moves: the Hipdrop with Kick/Wahda wa Noz and how to turn around with it. One of the most intensive shimmy's, the xuxu shimmy, is on the menu as well. These moves will be melted together into the second combination. Then, we will dance combination 1 and 2 of the choreography. Class 3 is probably the most sensual one. You will learn the body undulation/camel and how to travel sidewards with it. You will also learn the beautiful sensual horizontal figure 8 of your hips. You will move in different tempo's from slow to quick. Together these movements form combination 3. At the end we will dance combi 1, 2 and 3 and we are over half into the choreography. In the fourth class we are going to move through the space with a sensual travel step: chassé, with a touch of hips. In this class your upper body will be involved as well by doing the frivolous shoulder shimmy. Back to hips with a powerful hip twist that you learn how to do on the spot and while travelling and a strong sidewards hip accent. You learn combination 4 and then we dance combination 1,2,3 and 4 together. You are getting closer and closer to dancing the full choreography. The final week is week 5. You will learn one of the basic steps of bellydance: the Arabic step and how to dance it to different directions. Again you will work on your xuxu shimmy but this time combined with the lovely snake arms. This is the moment that you will dance all the combinations from 1 - 5 which means that you know the full choreography. We will drill it many times. Livelong access to the Program as long as the program runs. Thank you so much for the bellydance training video, Aisa! I love you so much and I'm happy that you teach bellydance online! I watched the videos and step by step danced along. I also think you are an amazing teacher! I look forward for the other people of this amazing course! Thank you very much for the videos. Your lessons are very clear and nice! Your exersises are wonderful. I really enjoyed my online belly dance class with Aisa. I was a bit skeptical about a dance lesson online at the beginning, but I have to say that it exceeded all my expectations. First it was really relieving to take a lesson from the comfort of my own living room, without having to waste time in traffic and returning home late and tired. As long as you have a good internet connection, an online class is as efficient as a "real" class. Second, Aisa is an excellent teacher. She makes you feel comfortable and gives you a lot of encouragement during class. "Thank you for the video's Aisa!! I love that you do the warming up at the beginning and the cooling down at the end like in a real class! I also love the fact that I can access the video whenever I want to practice and follow your instructions!" Michelle D.
"Thanks so much for this amazing belly dance training video, Aisa! I love how generously you share the basics from the scratch and teach with passion! Looking forward to other parts of the course! :)"
Dear Aisa, I want to give you my compliments and my apreciation for your work. 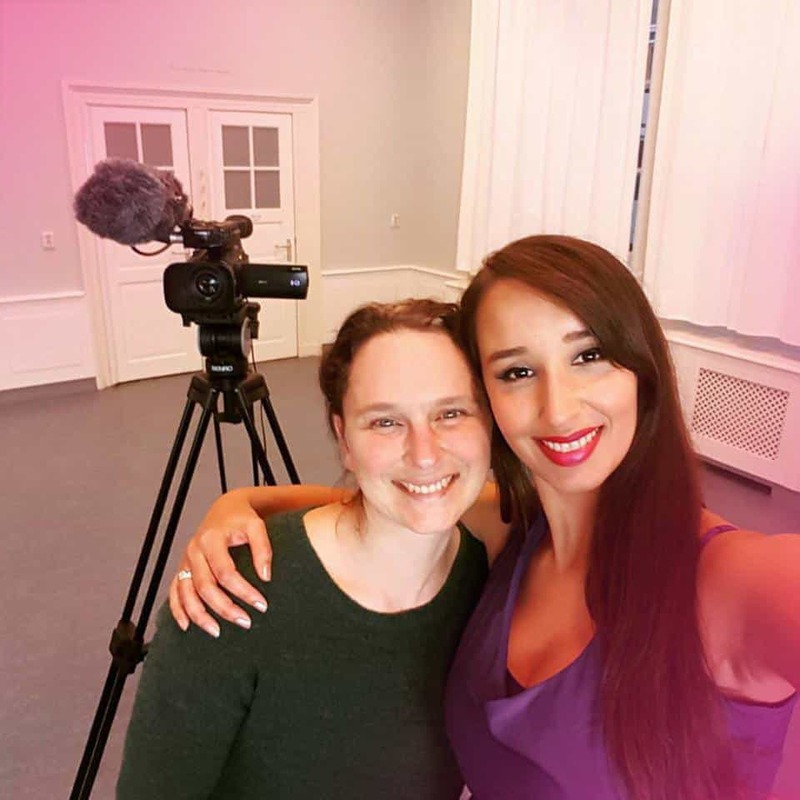 You are creating so much content to learn bellydanceing and many times for free, next to all the classes that you are teaching in Amsterdam. For someone like me this is the perfect solution. I really love bellydanceing but I can't find a fitting bellydance school in my city. Because of my fulltime job which is far away it does not fit in my schedule to go to a dance class at night after work in another city and travel home late. So this online course is a perfect initiative, I just love it! I have never danced bellydance before can I still join this course? This course is created especially for people with no bellydance experience. I will explain you the correct posture for this dance and I will explain the dance technique to you step by step. Do we also learn a choreography in this course and can we use it for our selves or for performances? Yes, you learn a choreography and you can use it everywhere you like if you mention that the choreo is from Aisa Lafour. Is it possible to start later than February 14th? Even if the program has already started? Yes, you can start whenever you want, but to get the early bird discount you will need to subscribe before February 14th 23:00 GMT+1. I get a livelong access to the program but can I ask livelong questions too? You have life long access to the program, as long as the program runs. There is a Facebook page where you can ask questions where I will frequently be present to answer questions. I have a very busy life, how can I integrate the program in my schedule? You can access the classes any time you want so you can do the class whenever and wherever it fits your schedule. This means that you can complete the course at your own pace. You can checkout with IDEAL and PayPal on the website. Is the package price including or excluding taxes? The price is including taxes. The tax amount will depend on the tax of your country. You can also reclaim the taxes for your business. In my country we do not pay 21 % taxes, does this influence the price I need to pay? Yes, you will pay the taxes that are valid in your own country. If I feel that this course is not for me, can I claim my money back? Yes, you can claim your money back for 100 % until 14 days after the purchase of the program.